The VocalEssence WITNESS: Yet They Persist performance on Sunday, February 24, 2019 will be performed as scheduled. Stand up and cheer as VocalEssence honors past, present, and future trailblazing African and African American women who persist against all odds to change their communities and the world. 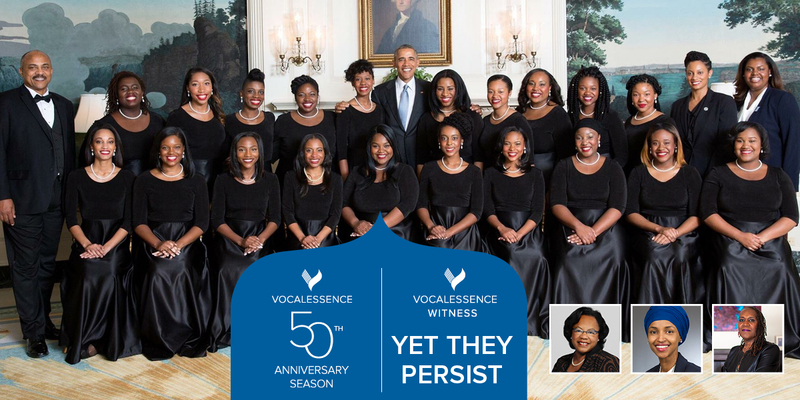 Atlanta’s Spelman College Glee Club will join the VocalEssence Chorus and VocalEssence Singers Of This Age in this electrifying program, which celebrates entrepreneurship, highlights the importance of education, and advocates for the equality of all. This performance will celebrate the contributions of four local women: Former Minneapolis Mayor Sharon Sayles Belton, Council Member Andrea Jenkins, Congresswoman Ilhan Omar, and activist Hallie Q. Brown.